The first time I was in Russia I, considering that I didn’t speak Russian at the time, was very excited when I came across a Moscow Times newspaper in an internet cafe in Red Square. The newspaper allows otherwise oblivious expats to understand a little bit better the news of Russia with a minimum of propaganda. By some miracle it was on a Friday that I found the Moscow Times and in it was a column that would become very near and dear to my heart. It’s called “The Word’s Worth” by a “Moscow-based translator and interpreter” named Michele Berdy. It teaches you about various aspects of Russian culture and the corresponding vocabulary. For anyone who is learning Russian, for anyone who is interested in Russia, this is a brilliant little article. The article I read on that Friday in October 2003, was about funny culinary phrases in Russian, like the difference between zharit’, tushit’, varit’ and svarit’, and my favorite was the phrase, ‘kofe ubegaet’ to mean that the pot of coffee is boiling over. I developed a huge crush on this article, on the Russian language and the thought of someday being knowledgeable enough that I could produce something so insightful. I have been a faithful(obsessive?) reader of this column ever since and have been a bit of a worshipper and envier of the Michele Berdy woman. Friday was my favorite day in Moscow. On my walk to school I would stop in a nice cafe(expensive restaurants and cafes that catered to expats or rich, English-speaking Russians usually carried the newspaper) and grab a new copy of The Moscow Times. Young Russians always felt really cool having some English text in their hand, so because the newspaper was free they’d often disappear quickly. But in worse case scenario I could go up to the Marriott by Metro Mayakovskaya and just ask the desk clerk for one. With care I would open up the newspaper to find a little sectioned off square. Often the column would be remarking on a political situation, like the article “Spinning the News” which was written during the Orange Revolution, and the skewing or spinning of the news by European and Russian news agencies, спиндокторы. She gives a lot of insight into the current holiday, like in the article, “Last Chance to Butter Up Your Relatives”, about the customs and accompanying vocabulary of the “buttery” holiday Maslenitsa. The famous week of pancakes, bliny, блины, ballyhoo and tomfoolery, a last chance to get sin out of your system, after which you would ask for forgiveness from family on Forgiveness Sunday, Прощённое Воскресенье, and then begin the 40 day fast, Великий пост. I have religiously collected these articles for the past 4 years, and so of course I noticed when someone came in and usurped the article. There was no sign of Michele nor her article for several months and then I stopped into the newspaper recently and someone named Michael Bohm was writing it, and at the end of the article said that Michele would be back in January. Well, January is half over and I’m beginning to get really worried about her. Maybe she had visa trouble, or maybe she got stopped by the Militsia on the street and refused to give a bribe…Oh, Michele, wherever you are, come back we are so worried about you. I did a search with her name and it brought up an article of hers on a website I have never heard of before. It hasn’t been updated since December of 2007 but it looks like it could be pretty interesting and Michele has got a few little articles there about translating. I don’t care who she writes for, I just hope she keeps writing. Maybe if I can get enough people to plea with her to start her column back up she will restore the joy to my life. 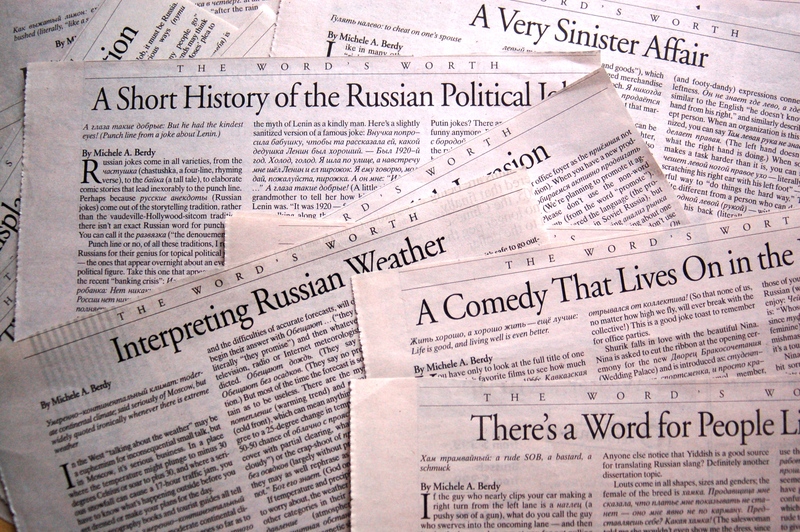 If you speak, love or are trying to learn Russian, these articles are awesome. The woman is genius and you will gain an awesome understanding and appreciation for Russia. Or from The Moscow Times, but only if you purchase a subscription. Normally(when Michele was in our lives), her article would be available for free on Fridays on the website in the OPINION section But you’d have to be a nerd like me and remember to check, because after the weekend it’s not available. As I said, I have almost all of them, if anyone is interested in obtaining copies let me know. I will probably post them in the future because I don’t have a whole lot of time to write big posts, so I’ll let Michele, in all her brilliance be the charming writer. I’m impressed at your resourcefulness to get you hands on the column you loved. I read the article you recommended. I think she does a great job pointing out how you really need to master the subtlety of a language to deal with something like cooking. How else can we understand the oddities of the way we describe our food and the way we cook it. Thank you for your post. 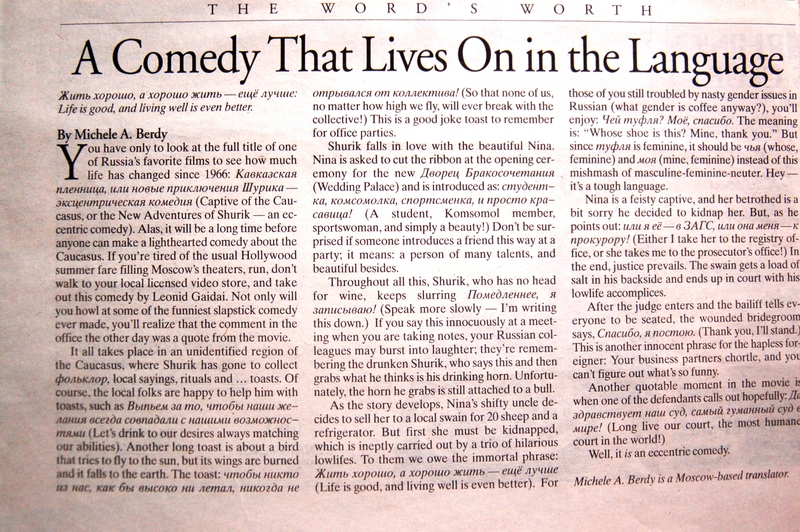 I am looking to get electronic copies of all the The Word’s Worth column’s. Please email me and we can discuss. Hi, Janey–I’ve been collecting Michele Berdy’s amusing and informative Moscow Times articles for years and I’m delighted to find someone who appreciates her as much as I do. I too have been waiting for her to return in January 2008, as promised, but just checked Moscow Times online and found that their web address expired on 2/3! Thanks for the link to rbth–I will definitely be checking that out. I heard Michele on an NPR news show the day after the Russian election. She was talking about the folkisms in Putin’s speeches. They mentioned this column and it is a little gem. There was one like it in the Russian Life magazine mixing language and culture. I just read her column about returning from the US after her father’s death and all the old Russian books she had discovered in his belongings. Hello – Can someone please post any old The Word’s Columns? I’d like to read the old ones that I never read. I’m also interested in getting hold of the Word’s Worth articles. Please email me to discuss it. Thanks. Scott, I’m not finding an address for you. If you are still interested I can send you the links to a google doc I made that has pretty much all articles since 2010 and quite a few leading up to that. Hello! Thank you for your upretiation for all that is Russian! I’m too in love with Mother Russia!! I’m in Aow about that place!